Tiffany completed her degree in Jurisprudence from the University of Oxford in 2015 with First Class Honours, with first class results in contract, tort, company, family, administrative, and EU law. In 2017, she obtained a Distinction in her BCL degree at the University of Oxford, with a distinction in intellectual property law and family law. Tiffany is a Bar Scholar. 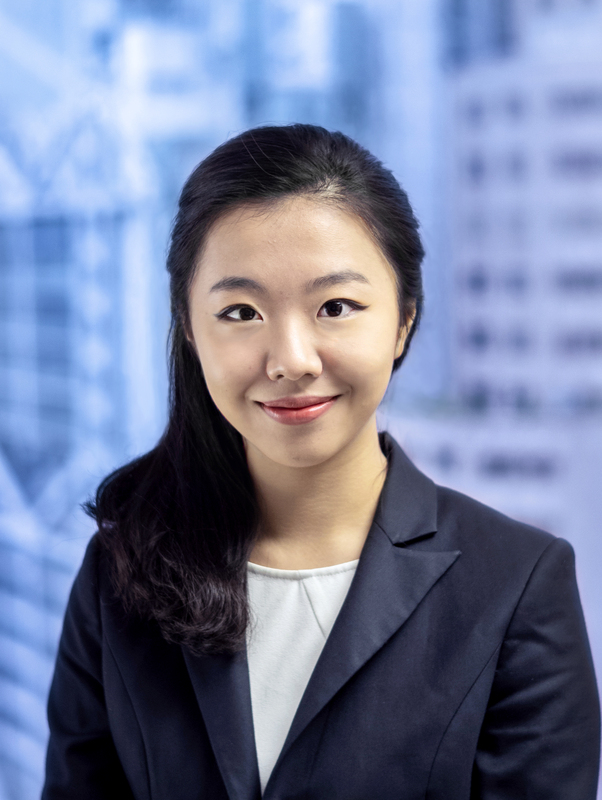 She joined Chambers as a tenant in 2018 after completion of her pupillage with Ms Maggie Wong SC, Mr Jenkin Suen, Mr John Hui and Mr. Christopher Chain. Tiffany is developing a broad civil practice and has been involved in a wide range of cases encompassing company and insolvency disputes, property and trusts matters, family law matters, public law cases and other civil and commercial disputes. Tiffany has appeared in the High Court for matrimonial, commercial and insolvency matters. She has also spoken at a CPD seminar on Update on Current Cases in Insolvency Law. D v G HCMC 4/2016 (19 June 2018) (Matrimonial proceedings ancillary relief) With Mr. Yang-Wahn Hew. Re Zexin Properties HCCW 348/2017 (Appointment of Liquidators). With Mr. Richard Zimmern. Ex Parte application for Worldwide Mareva injunction, asset preservation and ancillary disclosure order in the context of fraud). Led by Mr. William Wong SC. Application for Banker’s Trust Order. As sole advocate. Opposing stay of proceedings application. Led by Mr. William Wong SC. Opposing application to amend the terms of, and to sell assets subject to, the Worldwide Mareva Injunction. As sole advocate. Chan Pui Sze & Mak Hau Yin v Wang Jue HCMP 1655/2017 (Application to stay s.49 Bankruptcy Ordinance proceedings by joint and several trustees of a bankrupt). With Ms. Rachel Lam. ZPMC Offshore Service Co Ltd v Philip Jeffrey Adkins, RBF HK Ltd and Ors HCMP 426/2017 (Seeking summary judgment). With Mr. Richard Zimmern. Chen Lingxia v 中國金谷國際信託有限責任公司 and Ors HCA 2012/2016 (Opposing application to discharge injunction). Led by Mr. Anson Wong SC, with Ms. Rachel Lam and Ms. Cherry Xu. Kwan Shuk Ching v Wan Mei Yau HCA 2765/2016 (Application for inspection and specific discovery of documents) As sole advocate. Tam King Ching Kenny v Shanghai Industrial Investment (Group) Company Limited & Lau Wing Ching HCMP 2547/2016 (Opposing application under s. 285 and 255 CWUMPO- to convene creditors’ meeting for appointment of fresh liquidators) As sole advocate. Dacheng Enterprise Company v Global Bio-Chem Technology Group Company Limited HCA 2738/2017 (Resisting strike-out application). With Mr. Christopher Chain. Acting for a flight chartering company for a contractual dispute against a retail flight sales company. With Mr. Christopher Chain. Application for specific discovery. As sole advocate. Wong James Wai Ling v Forest Ocean International Ltd HCMP 1586/2018 (Seeking leave to commence statutory derivative action) As sole advocate. The Joint and Several Trustees of the Property of Chau Cham Wong Patrick, a Bankrupt v Laneve Company H.K. Limited HCA 1714/2014 (Setting aside default judgment) With Mr. Michael Lok. Appealed against a decision of the Family Court dismissing a discovery application (Closed to public). As sole advocate. Convoy Collateral Limited v Cho Kwai and Ors HCA 399/2018 (Acting for a Company against various de jure, de facto and/or shadow directors for alleged wrongdoings.) With Mr. John Hui and Mr. Howard Wong. Advised on the liability and quantum of a potential personal injuries claim involving a major rehabilitation service provider in Hong Kong. As sole counsel. Speaker, Cross-Border Asset Recovery and Tracing with Ms. Connie Lee. Speaker, International Schemes of Arrangements, Interim Relief and Inspection of Documents with Mr. Yang-Wahn Hew. Speaker, Personal Insolvency – Bankruptcy (HKICPA talk) with Mr Howard Wong. Speaker, Recent Updates on Insolvency Law (HKICPA talk) with Mr Terrence Tai. Speaker, Recent Company, Insolvency and Restructuring Developments (CPD Talk) with Mr Look Chan Ho and Mr Vincent Chiu. Mooting Coach, University of Hong Kong Mooting and Dispute Resolution Course.